UV rays from the sun are the number-one cause of skin aging. You probably already know this, which is why you regularly use sunscreen in the summer. But what about during the winter months? Do those gray days and thick clouds change your skin care routine? Winter sun can create lasting damage to your skin. Even during the cold weather, we’re at risk from ultraviolet radiation in the form of UVA rays. Though UVB radiation decreases, UVA radiation does not and it’s actually these rays that are more responsible for premature aging. They reflect off snow and can pass through glass. They’re not affected by changes in temperature, and can penetrate deeply into the skin, where they may create damage that leads to aging and even increases risk of skin cancer. They’re also more potent at higher altitudes—take note, skiers! 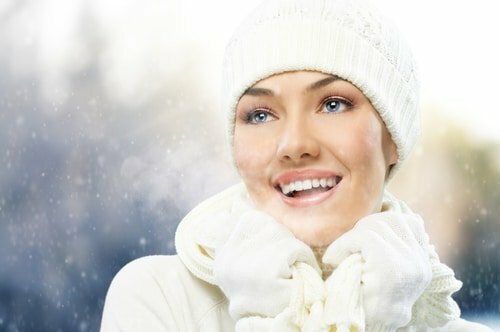 To retain more of your youthful complexion, try these tips for protecting your skin from winter sun damage. Use a safe sunscreen. Choose one that’s rated at a 30 SPF or higher, and that includes zinc oxide or titanium dioxide. Refer to the Environmental Working Group’s safe sunscreen chart for help. Avoid tanning beds. They are just as dangerous and sometimes even more damaging than real sun. An international study in 2006 found a strong association between tanning bed use and risk of skin cancer. Based on 7 worldwide studies, people who first used a tanning bed before the age of 35 increased their risk for skin cancer by 75 percent. Wear good sunglasses. The signs of aging tend to appear first around the eyes. Protect them with quality sunglasses that have UV coating on the lenses, and that are large enough to cover some skin around the eyes. Look for a tag that says the sunglasses block 99-100 percent of UVA and UVB rays, and make sure they fit well so they don’t slide down your nose. Don’t forget the lips. The lower lip receives a greater amount of exposure than the upper lip, and winter chapping can leave it more vulnerable to UV damage. Find a lip balm that contains a safe sunscreen to protect your lips. Avoid shiny lip glosses when out in the sun—they may attract more light to your lips, which can increase damage. Boost internal protection. Fruits and vegetables are high in antioxidants, which help fight free radicals and sun damage. Sugar and processed foods, on the other hand, can increase inflammation, which can make sun damage worse. Boost your intake of healthy foods to give your skin the edge it needs to deal with winter conditions. Bundle up. Hats, gloves, and scarves are indispensable in winter. Even if you don’t see blowing snow, a scarf can help protect your skin from cold, dry air as well as from the wind and sun. If you have sensitive skin, avoid those made with wool, as it can be irritating. Do you have other tips for protecting your skin in winter? Please share them with our readers. “International Study Links Tanning Beds to Melanoma,” SkinCancer.org, http://www.skincancer.org/news/tanning/iarc-tanning-link-study. I was wondering what product can help with fine spider veins on my cheeks. Please let me know. I bought a few sample kits and like the way my skin is looking, but I have to wear concealer or foundation to cover these lines. If I could get rid of them, I could wear something lighter in coverage this summer, like a tinted moisturizer or something. On that note, do you recommend any 100% organic makeup line ?